Oysters are equally delicious and nutritious, but you may be unaware just how important they are to marine ecology. They provide both a literal and a metaphorical foundation for aquatic ecosystems. Individual oysters filter 4.34 liters of water per hour**, removing phytoplankton, sediments, pollutants, and microorganisms from the water column. This process results promotes the growth of submerged aquatic vegetation such as sea grasses. In addition, oyster reefs provide a complex, three-dimensional, reef structure serving as nesting habitat and/or refuge, attracts numerous species of invertebrates and fishes … Furthermore, many of these organisms serve as forage for important fisheries species, birds, and mammals. Cheers! What’s better with bivalves than bubbles? This is why, in both the San Francisco Bay and the Chesapeake Bay, restoration of oyster habitat is seen as key to the broader restoration of the marine environment. This is not because the oysters are an end in and of themselves. They are a means to a broader restoration of marine habitat for myriad species, all of which require clearer water and the substrate of oyster shell either for themselves or for the species on which they depend. The species of oysters we see most commonly on the west coast, Crassostrea gigas, is not a native, but an import from Asia. The native oysters all along the west coast, from Alaska to Baja, is the Olympia oyster. But Olympias are harder to culture and slower to reproduce than gigas, and after a period of excessive harvesting in the 1800’s gigas were introduced to restore oysters as a viable commercial product. Olympias only grow to about 3 inches in size while gigas – which means “giant” in Latin – can grow to the gargantuan size of almost a foot in length. I have to say that for culinary purposes, even for barbequing, I prefer smaller, yearling oysters, not much more than 4″ in length. It is no longer legal to remove the oysters in the shell from the beach on Whidbey Island. You have to shuck on site, leave the shells, and either eat them right on the beach or take the shucked oysters home. This is because the baby oysters, the next generation, are likely to be attached to the shells of the ones that are big enough to harvest today. So if you take the shells of wild oysters off the beach you are killing the parents and their offspring. So I buy farmed oysters because they are good, they are cheap, they improve water quality and they are raised by a Coupeville company, Penn Cove Shellfish, LLC. Try ’em. You’ll like ’em. Here are a couple of the preparations we have been doing with our oysters. *… and yes it is “eat” and not “ate”. Look it up. ** Some sources state an oyster can filter up to 2 gallons of water per hour. 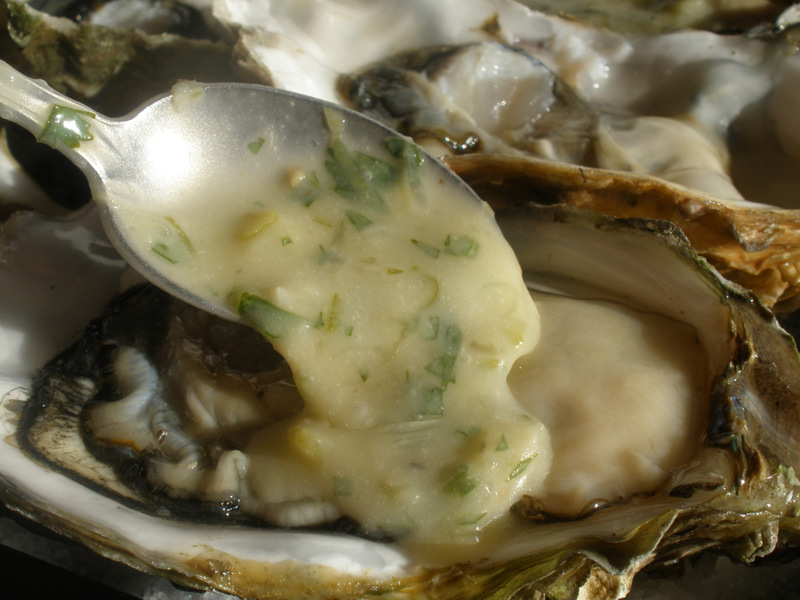 Combine together and spoon onto a shucked oyster. Broil until golden brown. This is a little bit of a twist on classic Thai flavors or lime, fish sauce, lemon grass, and cilantro. Clean the oysters by brushing the shells under cold running water. Shuck them, removing the top shell and cutting the bottom of the retractor muscle, to leave them detached but still in the round, bottom shell. Arrange them on a layer of rock salt on a sheet pan. To make the butter, put the wine, shallot, lemon grass and garlic in a small sauce pan on medium heat and reduce to sec. Remove form heat and add the lime zest and juice, fish sauce and pepper. Combine well. To this mixture, which is still in the warm sauce pan, add the butter and stir until the mixture is smooth and homogeneous. Finally add the cilantro and mint and adjust the seasoning with fish sauce, lime juice and pepper, as per your personal taste. Top each oyster with the butter and place under the broiler. Cook just until the oysters plump up and release their liquor into the shell. As you are probably starting to understand, the key here is some sort of acid reduction (white wine, vinegar, etc.) with some sort of other flavoring which you then mount with soft butter. 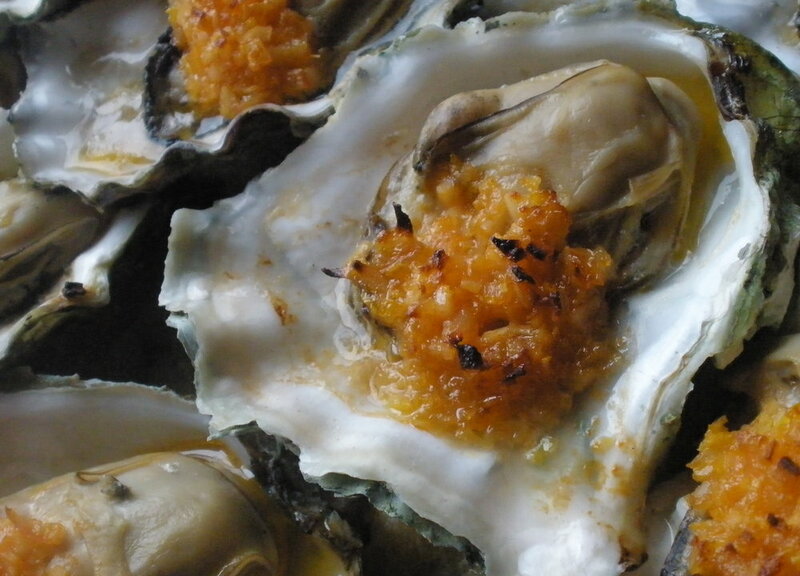 So go crazy with whatever flavors you prefer on your oysters. Clean the oysters by brushing the shells under cold running water. Shuck them, removing the top shell and cutting the bottom of the retractor muscle, to leave them detached but still in the round bottom shell. Arrange them on a layer of rock salt on a sheet pan. To make the butter, put the wine, vinegar, shallot and garlic in a small sauce pan on medium heat and reduce to sec. Remove form heat and add the lemon zest and juice and Sriracha. Combine well. Add the softened butter to the warm sauce pan and stir until the mixture is smooth and homogeneous. Finally, add the tarragon and adjust the seasoning with salt and lemon juice as per your personal taste. Top each oyster with the butter and place under the broiler. Cook just until the oysters plump up and release their liquor into the shell.